Mom and I crammed into the small doctor’s office. A wheelchair makes any room seem smaller. Mom waited patiently in the corner where the physician’s aid had set her. Rolling in and out of rooms has its share of challenges. A wheelchair quickly makes you realize how ill-equipped we are in our day-to-day life to accommodate the four-wheel monstrosity. The nurse smiled. “Then you’re her caretaker.” She and Mom both chuckled. Honestly, I really hadn’t contemplated my role in Mom’s recovery much. I’m her only son. She lives alone. She fell and virtually shattered her ankle and now needs someone to look after her while she heals. It hadn’t occurred to me to answer the question life asked any other way. It’s simply what you do. My wife, Sweet T and I are just both grateful that we can pull this off. It’s not easy and certainly not without sacrifice. But it’s probably hardest on my Mom who can’t get around on her own and do basic things that she’s accustomed to doing. If you know my Mom, she’s a social butterfly. Particularly since my Dad died. She took care of Dad for the last five years of his life after he suffered a massive brain hemorrhage brought on by a stroke. It limited her ability to live a “normal” life. She’s been a bright spot in the lives of others since God called Dad home. 1. With the top downward and the bottom up; upside-down. 2. In or into a state of utter disorder or confusion: “turning our ordered life topsy-turvy” (Anne Tyler). 1. Turned or positioned upside down; inverted. The quality or condition of being topsy-turvy. You don’t realize until you are faced with taking care of another human being just how many things you take for granted. You certainly can’t anticipate the drastic change to your routine that it brings. Add a little distance between you and your home base and you discover new challenges. It takes commitment and a strong relationship with your spouse. It helps having your in-laws living next door. And it demands more than you alone can give. It takes a whole village of friends and church family…including a sea of doctors, nurses, and healthcare providers. Hopefully, when it happens–and odds are it will—you’re prayed up, because you’re going to draw heavily on your spiritual bank account. 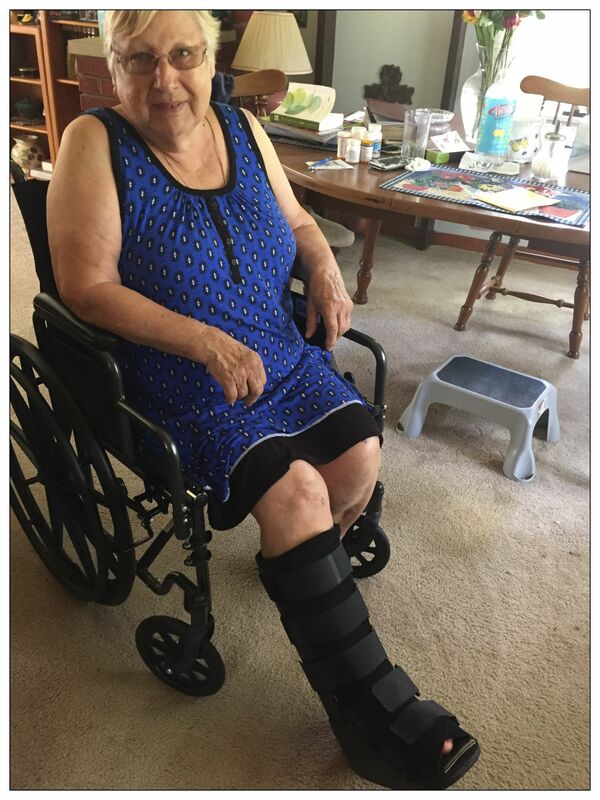 Mom continues making progress every day since her fall three weeks ago. We’ve been thankful for friends and church family who have stopped by to see her, write cards, and give her a phone call. Terri’s folks have been tremendous in helping cover the home front. Technology helps close the gap between here and home, which is something Terri and I are both thankful for as well. In the old days, we would have had to make a fire and send smoke signals. On top of it all, we had to say goodbye to our beloved 16-year old healer, Danny, as he crossed over the Rainbow Bridge. Although we knew his time on Earth was drawing to a close, it is still deeply painful. Like I’ve said before–life is downright hard sometimes. But, that’s what God is for. Leaning on the Lord in difficult times, depending on God to give us strength, to heal our hurts and our wounds–these are the moments that we can draw closer to Him Who Made Us. Apart from faith, I couldn’t do it. Find peace, brother. I pray, easily. For generations we have seen a decline in children who are willing to care for aging parents. It’s heartening to see first hand what family means to you. Your expression of faith explains your extraordinary strength. I recall that being more the born back in the day in Western culture. I believe it is still valued in Eastern cultures like China and Japan. Thank your fir kind words of encouragement. Thank you Anita! We appreciate your prayers. Recently returned from an emergency trip 10hours away taking care of my father (and mother), thankfully other sibs are there, but I’m the nurse in the fam. Really tough stuff, so I’m hearing you. Thanks so much for following The Ruminant Scribe. I read this post and felt an immediate connection with your situation, except I was the one in the wheelchair and my husband was the caregiver, i.e.,hoisting me and a wheelchair around the house, car etc. Broken ankle with surgery and 9 weeks of non-weight bearing after a fall in Alaska while we were on vacation. It certainly was not what we planned for vacation, but we would not trade the experience for anything! God was so real in His arranging things, meeting wonderful Christian believers, and seeing His mighty Hand in all of it, what a blessing it was. The post Vacations and Divine Appointments tells the saga … please check it out. It was republished on April 18, 2017. I would welcome your comments. Blessings to you and to your beloved Mother. Thanks for this Linda. I’ll definitely go check out your “Appointments” post.